Combining the best features of the National Science Foundation's (NSF) new Robert C. Byrd Green Bank Telescope (GBT) in West Virginia with those of the NSF's Very Large Array (VLA) in New Mexico, astronomers have produced a vastly improved radio image of the Orion Nebula and developed a valuable new technique for studying star formation and other astrophysical processes. "Our GBT image of the Orion Nebula is the best image ever produced with a single-dish radio telescope and it illustrates the superb performance of this new telescope," said Debra Shepherd, of the National Radio Astronomy Observatory (NRAO) in Socorro, NM. "By combining data from the GBT with that from the VLA, we get an image that reflects reality far better than images from the separate telescopes could do," she added. Shepherd worked with Ron Maddalena from NRAO in Green Bank and Joe McMullin, from NRAO in Socorro. The astronomers presented their work to the American Astronomical Society meeting in Washington, DC. Single-dish radio telescopes such as the GBT, dedicated in 2000, are able to capture the large-scale structure of objects such as the Orion Nebula. However, they are unable to discern the fine detail revealed by multi-antenna arrays such as the VLA. Conversely, a VLA-like array is "blind" to the larger-scale structures. Combining the data from both types of radio telescopes to produce an image showing both large- and small-scale structures in the same celestial object has been a difficult, laborious task. "We are developing new observing techniques and software to make this task much easier and quicker," said McMullin. "We now have achieved in hours what used to take months or even longer to do, but we are producing an observational tool that will allow astronomers to make much higher-fidelity images that will greatly improve our understanding of several important astronomical processes," McMullin added. For this observation, both the individual images from each telescope as well as the combined image were produced using the AIPS++ (Astronomical Information Processing System) software, developed, in part, by NRAO. The observers worked with Tim Cornwell, NRAO's Associate Director for Data Management, to develop the techniques used to combine the images. The Orion Nebula, easily visible in amateur telescopes, is a giant cloud of gas some 1,500 light-years away in which new stars are forming. 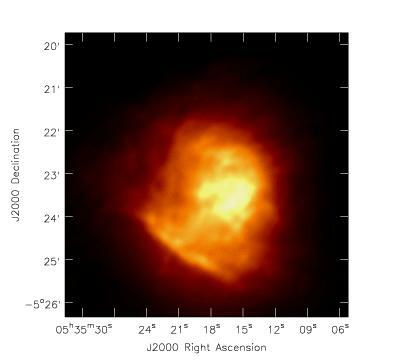 The GBT-VLA radio image, Shepherd said, shows new details that will allow scientists to better understand how ionized gas near the young, hot stars at the nebula's center flows outward toward the edge of the nebula. 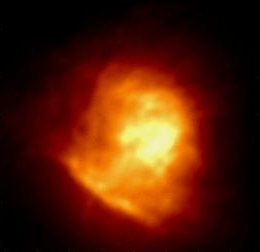 The ability to produce combined GBT-VLA images also may revise scientists' understanding of other objects. 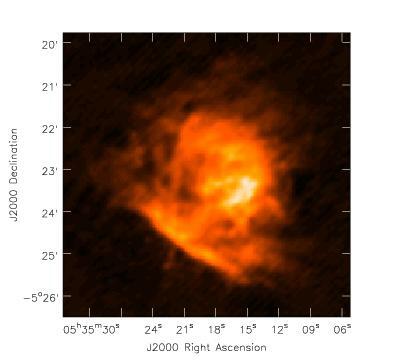 For example, says NRAO Director Paul Vanden Bout, "Astronomers have seen many pockets of ionized Hydrogen gas in star-forming clouds with the VLA that are thought to be ultra-compact. It may be that they are, in fact, larger than thought and, using the GBT in addition to the VLA will show us the true picture." The importance of this observing technique lies in its ability to greatly improve the fidelity of images. "By fidelity we mean how closely the image actually reflects reality. We now have a powerful new tool for improving the fidelity of our images when we look at objects that are close enough to appear relatively large in the sky but which also contain fine detail within the larger structure," Shepherd said. "This will have a big impact on a number of research areas such as star formation in our Galaxy, planetary nebulae, supernova remnants, as well as dynamics and star formation in near-by galaxies," she added. The new technique also paves the way for effective use of the Expanded VLA, which will incorporate state-of-the-art electronics and digital equipment to replace now-aging technologies dating from the VLA's construction in the 1970s. In addition, the new capabilities can be used with the Atacama Large Millimeter Array (ALMA), a millimeter-wave observatory to be constructed in Chile as a partnership among North American, European and Japanese astronomers. 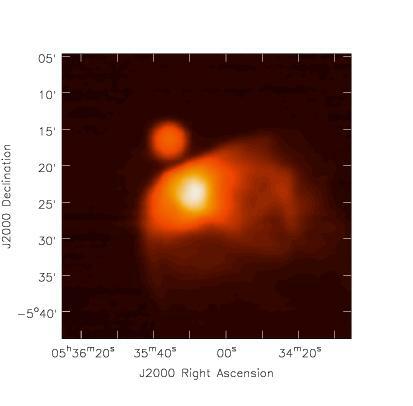 The combined GBT-VLA image was produced from observations made at a radio frequency of 8.4 GHz. The VLA observations were made in 2000 and the GBT observations in November of 2001.